In a time of grave uncertainty, when we are troubled by forces that we feel are not within our control, it is important to remember in what part of the world we live. There is great power afforded to us as Americans. We possess agency, not only to speak our minds, but to change our political system. We have opportunities not provided to most people, which is why our ideas, beliefs, and values are important to the rest of the world. It should be our goal, as Americans, to deepen our democratic institutions and promulgate ideas of equality, liberty, fairness and opportunity, declaring to the world that the United States is a country continually striving toward these ideals. This theme extends to the Million Women’s March, in which nearly a half a million people came together on January 21 in Washington D.C. to celebrate the social progress America has made. The March was and is a testament to the resolve many millions of Americans feel to preserve the integrity of our democracy. The Women’s March extended beyond Washington to hundreds of cities around the globe as women marched in solidarity with the people in Washington. 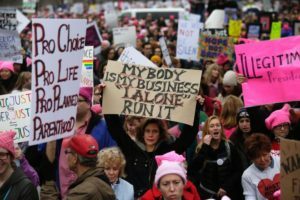 These systematic organized protests were a response to a woman’s inherent rights threatened by Donald Trump’s administration. The March revealed deep seated frustration felt by millions of people around the world. Importantly,these Marches demonstrated, particularly to younger generations, that they also have an opportunity to exercise their rights in the form of civil dissent and public protest. The March is part of a long American tradition protesting human rights violations that includes not just the rights of American citizens, but the rights of immigrants and refugees. The message from that day was about how human rights should not have to succumb to political ideology for they are inalienable and inherent for every person. Talking to students across the Franklin & Marshall community who attended the Women’s March, there was a consensus that President Trump is betraying essential American values and important democratic traditions. A fellow student at Franklin & Marshall, Leah Issokson, offered her perspective after attending the March on Saturday. She described the March as:“A reaction to Trump being such an extreme candidate…waging a war on so many different groups…It wasn’t just about [Women]. It was about every group that has felt fear, inequality and persecution or knowing somebody else that has experienced fear and persecution”. Leah emphasized that the March was not necessarily an example of political activism. Instead, she said that it felt more like a fight for “moral issues” than about politics. Pivoting to Leah’s argument, I asked her if she has “witnessed or talked to a lot of people on both sides of the spectrum at the March”? Leah conveyed that solidarity was very important to the cause of the Women’s March, however, she also communicated:“It was not just about political activism or about being a Democrat or Republican. There were a lot of people on both sides of the spectrum [demonstrating that] being a Republican doesn’t mean this.” The Women’s March was perceived differently depending where on the ideological spectrum you are. To some, the Women’s March conveyed a self fulfilling prophecy that painted them as righteous, benevolent, and most importantly “morally right.” For others, the March conveyed a very different message: if you are not on the side of liberals, you are not “morally right.” The repercussions of this are that the schism is exacerbated further. It comes down to who is most right. There are grievances that both sides of the schism have in common. I can’t speak to who is “more right” generally, but in this case I do think that the Women’s March is similar to past movements, such as civil rights or Women’s suffrage. Americans are right to try and protect human rights. The Women’s March served its purpose as a symbol of a growing human rights movement. It also set a precedent that there is a line that can be crossed within American Democracy. President Trump has crossed that line.It is important that we remember civil protest as a sign of a healthy democracy. President Trump has also set a precedent that certain groups/ethnicities/races/genders have more rights than others. If Americans allow this to happen then what is to stop our current President from taking away the rights of more and more people? In American democracy, the law does not discriminate between anyone of any origin or inherent quality. The laws of our constitution, and the ideals of our democracy, exist to protect us from ourselves. But, it doesn’t happen if we stop respecting the standards previous generations set for us. Since the night of the 2016 Presidential election there are many students, including me, who are resolved to oppose anything resembling “Trumpian” politics. I remain active on social media: signing petitions, liking newspaper opposition pieces directed toward Trump’s behavior and policies, sharing articles as well as my own opinions. I know that there are many of us on this campus who have acted similarly. However, there comes a point when Facebook and Twitter are not beneficial and instead exacerbates the existing schism. These artificial public forums are not dynamic enough in that our words, beliefs, petitions, articles aren’t reaching the other side. Instead our posts are filtered and purged to the point where we are only sharing with people with whom we agree. The result is that I am not changing the minds of Trump supporters nor are Hillary supporters changing the minds of others. We are simply not breaching the sound barrier on either side of the spectrum. We are shouting into an echo chamber where we block, unfollow or ignore those who challenge our beliefs. We tend to like people that agree with us and are averse to those that contradict our ideas, opinions or beliefs. These are the ideal environments we desire and construct for ourselves because it supports our self-image and need for inclusion and approval.Indulging in this, however, neglects an important responsibility as Americans. The ideals we strive for depend on the proliferation of many different ideas and discourse that cause us to think critically about why we believe something to be true; is it true because it’s fact, or because we just want it to be true. For me, my job will be to challenge my version of reality by having an open mind to ideas and opinions that I don’t agree with. As the Women’s March demonstrated, I believe it begins by finding common ground and starting constructive conversations with ideologically diverse people. It is possible that many people you talk to will choose not to listen. But regardless, it should always start and end with a handshake.